Home Ramblings 1100+ Miles and Culture Shock! 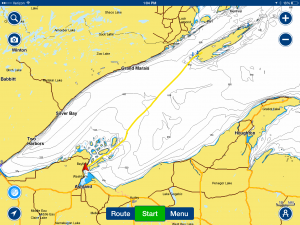 We were facing 80 plus nautical miles to cross Lake Superior from Windigo Harbor on Isle Royale to Stockton Island in the Apostles. Our last day on this trip would exceed our first day in terms of distance. Weather reports suggested a fairly calm morning in the region. Afternoon forecasts predicted rising winds out of the northeast. That promised a beam reach. 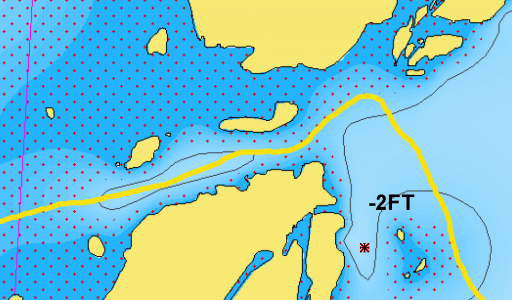 Great for sailing but potentially rocky from building seas down the length of Lake Superior. 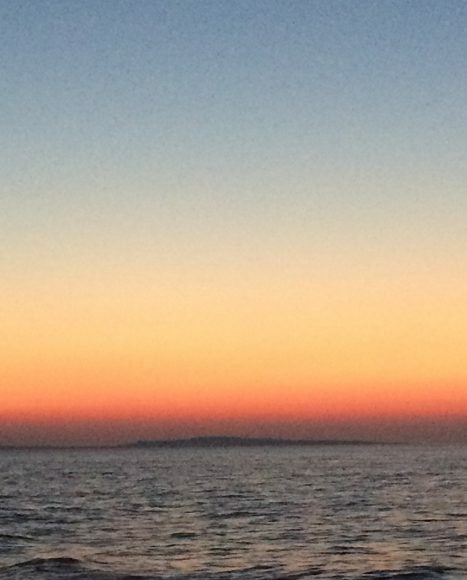 A 200-mile-plus fetch from, say, Otter Island to Outer Island. To take advantage of a serene morning on the lake we targeted a 4AM departure. We got up at 3AM, which is ridiculous for us. And cold and dark in northwest Lake Superior in September. We left the dock at Windigo an hour later. I’m not lying here; we actually did leave at 4AM –right on schedule. For those of you who know us well, you know that at least one of us is not known for punctuality. This was the first time we ventured out in complete darkness and we had some distance to travel in the Washington Harbor channel before we hit open water. All in complete darkness with only a half-moon lighting our way. In the lessons learned category, I should have been at the helm at this time for two main reasons: 1) Dan is not a morning person; 2) I did the chart work and was more comfortable with the route that I had built. Dan also has far better night vision and while I really enjoyed sitting on the side of the boat as lookout, Dan was just a bit agitated as he only had the electronics to guide him. Did I mention that Dan is not a morning person? We cleared the Rock of Ages Lighthouse with no issues and set Ted (our first-mate autopilot) on our 12+ hour course for the Apostle Islands. 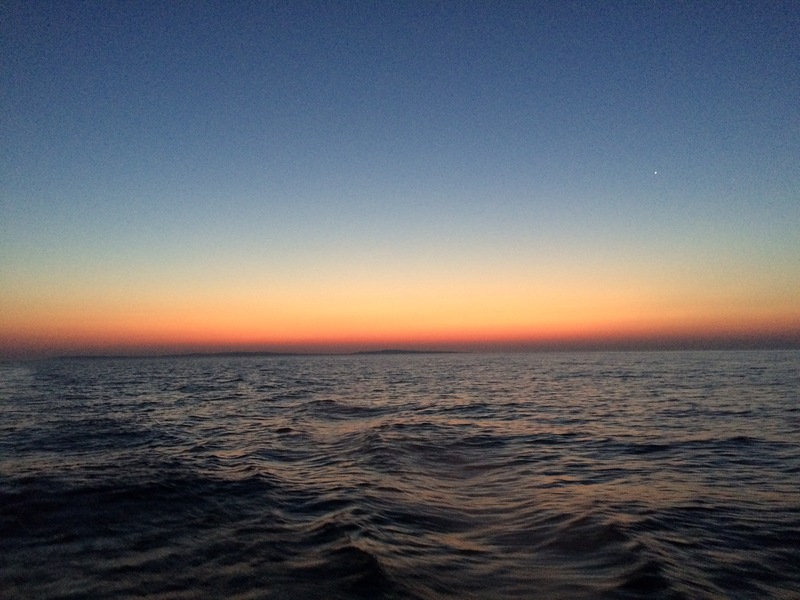 The seas were unruffled with just a light breeze and it was heavenly to watch the sun slowly rise as we puttered along. The crossing was fairly uneventful but our decision to leave early paid off as the waves and wind started building in the afternoon with uncomfortable swells hitting our starboard quarter. As I was getting rolled around below decks trying unsuccessfully to get in a nap, Dan called down and said it was time to raise sails. 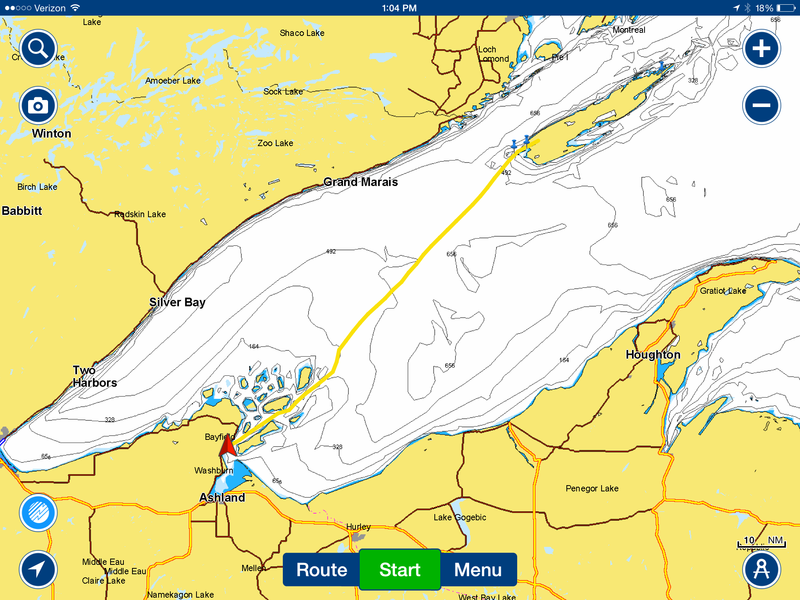 We had a wonderful sail for a couple of hours until the wind changed direction just before we reached the outer Apostle Islands. Then that fetch started roiling the surface of Superior more than the wind could keep the sails filled. 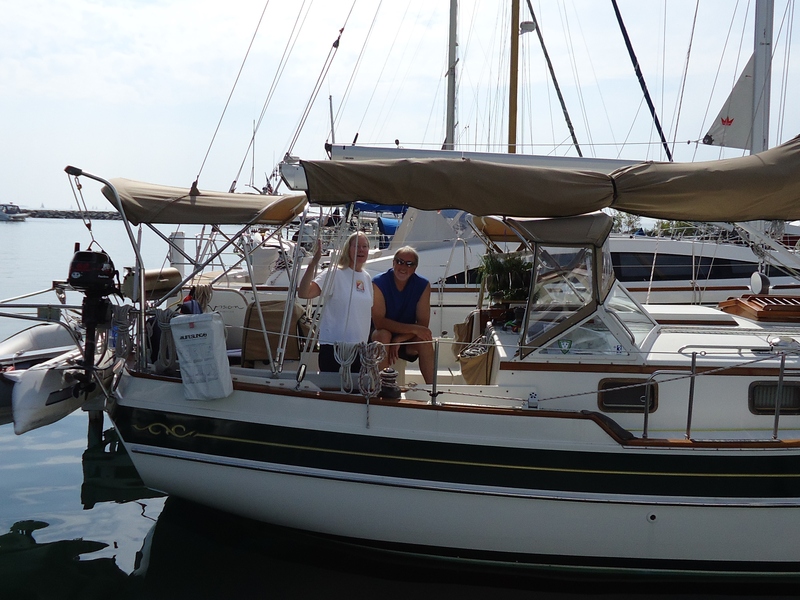 After a few minutes of flogging canvas and rolling yaws we doused the sails and motored on. Our intention was to stop at Stockton Island (our departure point when this little adventure started over two months earlier) but it was 5:00PM when we rounded Presque Isle Point to enter Presque Isle Bay on Stockton’s southwest side. The bay was filling up with boats gathering for Labor Day weekend, and we could see more coming. I wanted/needed a shower. Dan had taken a plunge into the waters at Windigo the previous evening, but there was no way in hell I was jumping into 60° F water. So we passed up Stockton and continued another hour and half to our home port of Pikes Bay. Keep in mind that we had gone for the past several weeks rarely seeing another boat. 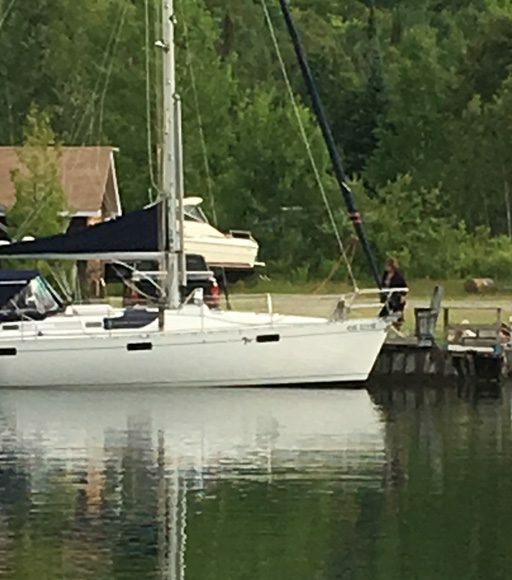 To suddenly be faced with dozens of sailboats, ferries running back and forth between Bayfield and Madeleine Island, and the odd power cruiser tossed in for good measure was a shock. Rules of the road – who needs those when you’re the only boat in sight? Suddenly we were having to pay attention to who was on a port or starboard tack, who was overtaking, etc. Yikes! After Dan tried to play chicken with a ferry, we pulled into Pikes Bay Marina just after 7:00pm. Another culture shock – we were surrounded by hundreds of boats and people celebrating the start of a long weekend. The parking lot was overflowing, kids were running up and down the docks. My immediate reaction was that we had made a mistake and should turn around and go back out. And then I thought of that wonderful shower with an endless supply of hot water…. September 5 – Refreshed from the crossing after showers and a good nights sleep. Photo by Mike Evans. 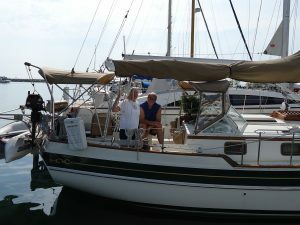 Our little summer trek had taken us to two of the Great Lakes over 9 weeks, covered more than 1100 nautical miles, and was a most fabulous adventure. 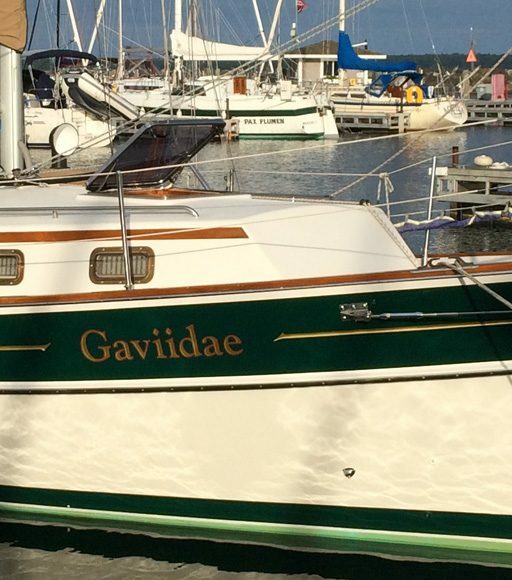 We met wonderful people, explored gunkholes, tested out Gaviidae’s capabilities (Love this Boat! ), and Dan and I are still happily married. In fact, the next day we celebrated our 28th wedding anniversary with dinner at the Good Thyme Restaurant near Washburn. It was good to be back in civilization, but we spent much of the evening planning next summer’s trip. 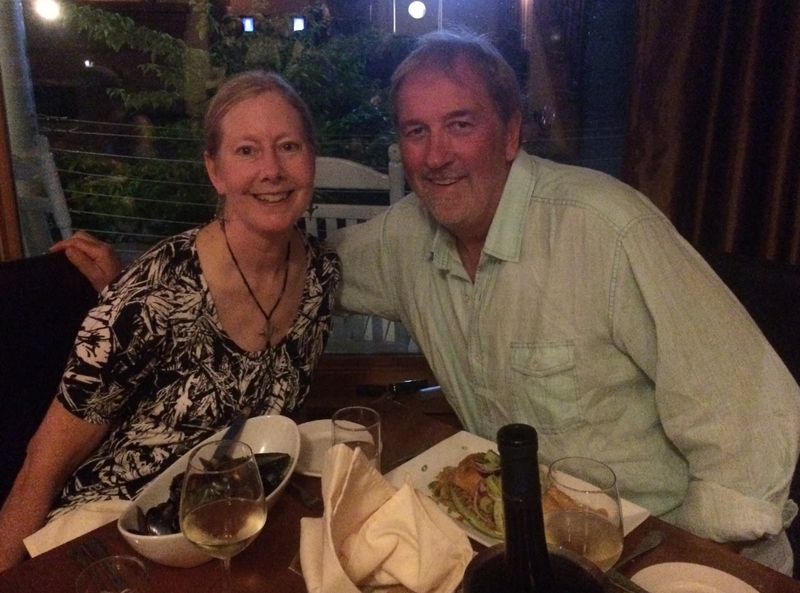 September 5 – Our anniversary at Good Thyme – 28 years! Thank you Ellen for the anniversary wishes. Gaviidae will be hauled out and put on the hard in a few weeks for the winter and then we start the next phase of the nomad life.